First off, I hope you all had a wonderful Thanksgiving :) Please excuse my couple days of leave, I was enjoying all of my extended family. It was an absolute blast! I love good company and good food. The biggest reason I love Thanksgiving, is it reminds us all to reflect on all we have to be grateful for. I have had so much to be thankful for this year, but specifically, I am most grateful for the miracles that took place to save my husbands life earlier in the year and that I get the to have my hubby here with me today. Some of you remember the scary events that transpired starting in mid-March of this year, but I never fully posted the details of the event. I think I might finally get the courage to post it on my blog sooner or later. Needless to say, Thanksgiving really was special for me and my family. I am so grateful for my husband. He is my best friend and the love of my life and I can’t imagine what life would be like without him by my side. I am also grateful for you wonderful people and the support you lend me. My blog would not be where it is today without you. You mean so much to me. Your emails and kind comments always brighten my day. So, thank-you! Now, let’s switch gears to today’s recipe. A fact about me: I hate raw meat. I know, I know. I have a food blog, I should be used to dealing with it by now. Truth is, it still freaks me out. I am a huge germaphob. Anyone that knows me on a personal level can attest to this statement. I wash my hands WAY more than necessary, sometimes 3 times on the same wash. You can imagine the anxiety I get when I have to pull out raw meat to cook. Before I get out the meat, I lay down a tarp over my counter top. This can be a clean garbage bag laid flat or something of that nature. Next, I bring out the meat. Carefully, I trim it or cut it or do whatever needs to be done. Once my meat is ready for the specific meal and placed in the pan/crockpot, I roll up the tarp carefully so that nothing splatters or touches anything. I open the garbage with my foot and carefully throw the rolled tarp away. I wash my hands profusely. Then, I 409 and clorox wipe my entire counter top. I finish by washing my hands one last time. You may think I have a little OCD, and that may as well be true. My close friends and family laugh at me and ask me how the clean up went whenever I serve them dinner. When working with meat, I usually chose cuts that are whole and don’t require a lot of handling. My husband and I were watching TV a few weeks ago. The show we were watching had a family at the dinner table eating meatloaf. Second fact about me: I have never cooked meatloaf before in my life because the thought of having to squish and form the meat sends this raw-meat hater into a nervous fit. Back to the TV show. As we are watching this, my husband turns to me and says, “I wish I could have a meatloaf for dinner. My mouth is watering at the site of this dinner. Do you think you could make me a meatloaf sometime?” I ignored his question and pretended as if not to hear it. Not to be mean, but because I could feel the anxiety creeping in. A couple days later my husband called me from work. He told me it had been a stressful day and that he wouldn’t be home until late because there was a lot he still needed to get done. There is nothing I love more that to have a meal ready for my husband when he has had a long day. Food is a source of comfort and sometimes can bring a smile to any stressed face. As I pondered what special meal I wanted to cook him, a little voice in my head kept saying, “MEATLOAF! MEATLOAF! MEATLOAF!” Fighting away my nerves, I decided to tackle this meal that I had been so afraid to attempt in the past. Guess what? !… I survived. I had conquered one of my biggest fears in the kitchen. I made a meatloaf. Not just any meatloaf… no. This meatloaf is INCREDIBLE! I am so glad I got passed my fear because it was SO worth it. My house smelled amazing the entire time it cooked and every bite was mouthwatering delicious. One of the best parts about this meatloaf- its a slow cooker meal! SUPER easy! 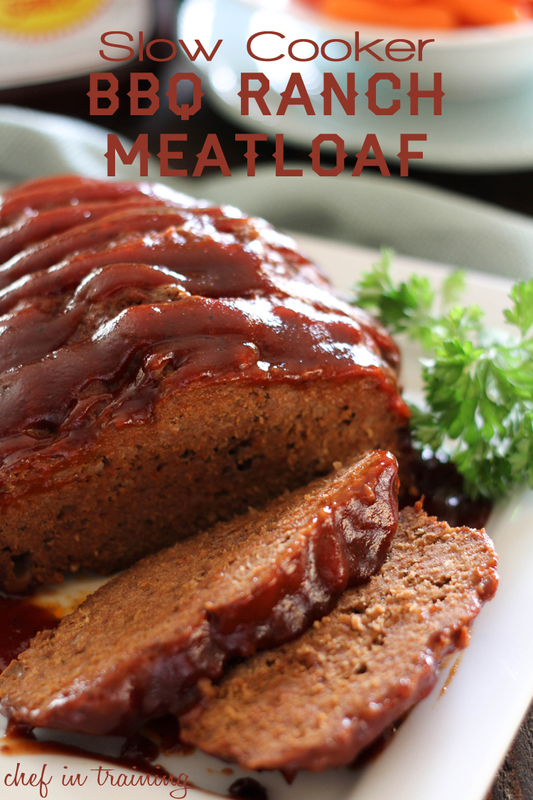 This recipe is so easy and could be THE BEST meatloaf I have ever eaten! In a large bowl, mix beef, sausage, bread crumbs, eggs, ranch packet, ¼ cup of BBQ sauce, onion, salt and garlic together by hand in large bowl. Add to slow cooker and form into a loaf shape. Add desired amount of BBQ sauce on top of loaf to glaze and cook on LOW for 6 hours. Once cooked and ready to serve, top with more BBQ sauce if needed. This sounds so good, only yesterday I was thinking its been too long since we've had meatloaf! And I totally get where you were coming from, there does seem something a bit ewww about squishing meats, I have been known to use a couple of wooden spoons to try mashing it up, doesn't work! I am going to try this recipe this week. It sounds great. What kind of sausage do I use? Something like a roll of Bob Evans mild sausage? I don't like cooking meat either, but have found using plastic disposable food service gloves (the kind they use at the deli to slice meat) really helps. They are super inexpensive (I found them at Big Lots) and one box of 750 gloves lasts me several years. As a mom of six kids, I have also used them to fish out toys dropped in the toilet! Just saying. Just a note from a fellow raw meat-hater:) You can put all of the ingredients into a large ziploc bag and squish them up that way. Then you don't have to do that actually squishing with your bare hands and you could just throw the used bag away. This sounds delicious, but 4 lbs. of meat is too much for us! If I halve this recipe, how long do you think it should cook in the crockpot? Did you try cutting the recipe in half? Only you could make meatloaf look beautiful! I'm the same way with cleaning my kitchen (and hands) after handling raw meat, especially chicken. I hate touching meat - how it sticks to your fingers, gets under your nails... YUCK!! But I found the best solution at a Pampered Chef show... use a potato masher! She used one to make meatballs - she dislikes feeling the different textures of the ingredients. It works great!! What a great tip! Thanks so much for sharing! I, too hate raw met (I actually use surgical/medical gloves to handle chicken - no, I am NOT kidding). If that potato masher thing works, I'll be indebted to both of you for life (but I'm old, not terribly well, and not wealthy, so it won't be very rewarding to have my indebtedness. I shall be gratefull, nonetheless! ever think of using gloves? Haha... You know, your Kitchen Aid mixer would do a lovely job of meat squishing for you. :) Those babies are awesome at just about everything! What a fantastic idea! I cannot believe I haven't thought of that before! Next time, I know what I'll be doing! Thanks for the tip! I love meatloaf recipes, and using the crockpot is even better! Hi, what size crockpot did you use for this recipe? or doesn't it matter? I'm just afraid if I form the loaf in my large oval crockpot it may not cook as well? Thanks for your help! I used a 5 qt oval shaped one! It works perfect because the loaf is long and fits in the oval great! Someone else had asked, if you cut the recipe in half what should the cook time be? Please advise what type of sausage to use. Mahalo! I used ground sausage (mild) hope that helps :) Let me know if you have anymore questions. Do you use the ranch packet for making ranch dip (for sour cream) or the ranch packet that makes ranch dressing for salads? I love meatloaf! This is a great recipe. I've never tried cooking a meatloaf in a slowcooker. I'll have to try this the next time I get a craving. I like to add sliced mushrooms to my meatloaf because it keeps it from drying out. I bought ALL the ingredients to make this meatloaf for tomorrow. I'm so nervous & excited only because it's the first time to EVER cook OR EAT meatloaf....but hubby asked if I knew how to make it. Thanks to your recipe...we will find out ! i've also cooked mine with a couple of pieces of bread on the bottom to absorb the 'goo'! works really well let me know how it works out....just don't eat it!!! BBQ sauce AND ranch dressing mix....sounds like maybe I can get my kids to try meatloaf for the first time ever! I also hate touching meat.....so I buy Deli Gloves! Also, the Kitchen Aid helps with mixing ground meats. I made this today and it was so yummy! It cooked while we were at church and then we came home to meatloaf! Thanks so much for the recipe. I have the same issues as you with raw meat. I do the excessive hand washing, laying a bag down and Clorox! I found plastic gloves in a 100 pack at Dollar Tree so I never have to touch raw meat again! They are plastic like a plastic bag, not rubber or latex. Plus you can't beat the price! I've never been able to cook meatloaf correctly, it's always raw in the middle no matter how long I cook it for. This recipe looks amazing, will try next week! Thanks! This seriously is one of the best meat loaves I have made! Easy to make and the smell while its in the crock pot is just amazing! I will definitely make this again and again! What type of sausage did you use? Thanks! This looks soo good! How many does this serve? I have this in the crockpot as I type this. I keep thinking 3lbs of hamburger was too much? It makes a huge amount and fills up my large oval crockpot.. I am planning to freeze half of it. Anyway.. it just seemed like 4 total pounds of meat was too much and I wondered if the recipe was wrong. It must serve like 16 portions? This recipe is currently making my house smell delicious! But I am wondering if there is usually a lot of grease in this? I am using ground turkey and I saw the idea above about putting bread under it but I would have to put a lot of bread to soak up all this grease! Any suggestions? What about just using two pounds of ground beef.. How long do I cook then? Hello! I love this recipe! Its always a bit hit when I make it! I was wondering what brand/kind of BBQ sauce do you use? I have tried different ones but have not found one that's perfect yet! Thank you!! Hey, Just wondering why you arent answering questions that people have :( I would also like to know what you specifically did about all the grease that comes out, and also how many servings did you end up with. 4 pounds of meat seems a little excessive so if I cut the recipe in half could I still cook it for the same amount of time or do I cut the time in half as well. Please answer us we are all wanting to know since it is your recipe. I apologize. The number of comments I get a day is a lot and I do my best to answer the questions when I can. I have never cut the recipe in half to know the cook time. You can try it cutting it in half, but as to the cook time I do not know. Also with the grease, I haven't made this in a little while, but you remove the met loaf from the crock pot when its done leaving the grease and drippings behind. There really isn't a way to avoid the grease all together. You end up with about 5 servings, give or take depending on how much people eat. Hope that helps. I cook meatloaf in the oven on a baking rack to avoid the grease isse. But growing up, when my mother made meatloaf (also in the oven) she would take a saucer (or small plate) and turn it upside down in the middle of her corning ware dish and then place the meatloaf on top of it. As the meatloaf cooked, all of the grease was sucked up underneath the saucer and away from the meatloaf. I don't see any reason why the same technique wouldn't work in a crock pot. This sounds delicious. I've seen crock pot meatloaf recipes before and have always wondered why use a c.p. instead of an oven. You still have to squish all the ingredients together and form a loaf before cooking so it's all the same steps. Is it just a matter of cooking it evenly? I'm saving the recipe regardless of how I cook it! One word.... GLOVES! Disposale latex gloves are awesome for making meatloaf and other various icky tasks. Can't wait to try the meatloaf... Sounds delicious! So excited to try this! 2 of my favorite flavors, combined! And I have never made meatloaf as I despise ketchup and almost every recipe I see has that in it. Thanks for yours- can't wait to try! Did you use garlic powder? or minced garlic? How do you think minced garlic would work? What side dishes do you typically serve with this. If you throw a carrot, celery and onion into a food processor until very fine then mix it into your loaf, you can slip some additional veggies in to your kids meals without them noticing. for the slow cooker bbq ranch meatloaf how long do you cook it and on high or low? I'd love to make try your BBQ ranch meatloaf recipe, I was wondering if you could downsize the recipe? This meatloaf looks delicious! I want to try it, but here in South Africa we do not have "powdered ranch mix". Maybe if you explain exactly what it is, I can find a substitute? Or maybe you can recommend a substitute? I only recently came across your site and am enjoying everything I see and read! I already have quite a few recipes I am dying to try! Thank you so much for all your lovely ideas and recipes! Powdered ranch mix is a packet--you use it to make ranch dip for vegetables and such. I've never done it, but if I were you I would probably use 1/2 cup ranch dressing and another 1/4-1/2 cup of bread crumbs to absorb the extra liquid. One tip: put a "wad" or two of tin foil at the bottom of the slow cooker, so that the loaf is suspended above the grease. This way the grease drips down and the meat stays out of it. How small do you cut up the sausage? what kind of sausage do you suggest and do you take it out of the casing? When you say garlic.... do you mean crushed garlic? Minced garlic? Garlic powder? Garlic salt? Anybody else that's made this, what did you use for the garlic? Hello! Thank you for posting these wonderful recipes! With the crock pot recipes, should there be any liquid before putting the meat into the crockpot? I usually put a 1/2 cup - 1 cup of water to be sure. Not sure if the meat would stick to the bottom of the crock pot. Thank you! Thank you for a the great recipe, it is my microwave meatloaf recipe, except I have wrapped bacon over the top and covered with BBQ sauce. I just wanted to let you know that I mix my mince with my cake mixer as I have difficulty with my hands and I don't need to touch the ingredients, hope this helps. I love your recipes, thanks again. I have found if you crumble up a piece of aluminum foil on the bottom of crock pot the grease will drain to the bottom of crockpot also you can fold heavy duty foil length ways to insert length ways for handles to lift out your meatloaf. This recipe sounds good I'm gonna try to make this. Hope this info helps. Meatloaf looks delish. And from one germophob to the next, consider wearing disposable gloves when kitchen chores require using your hands to touch or do disgusting things! ? Haven't heard of " ranch mix". Can you give us the details? Much obliged, and hungry. I love meatloaf so much! Can I make it double at once then only eat a half and store the other half in a sealed container and chill it in the refrigerator for the next day? Our favorite meatloaf recipe now!